On Tuesday "A Charlie Brown Christmas" airs on ABC -- the first of hopefully many airings this holiday season! Yay Snoopy. Ok, so Charlie Brown wasn't quite as happy about Snoopy embracing the commercial side of Christmas. But who doesn't love Christmas decorations? They give the holiday a beautiful glow. So if your pet could decorate their living space for the holidays, what would it look like? Here's your chance to figure it out -- and win prizes! From now until Dec. 20, decorate your pet's dog house, cat condo, crate, cage, bed or other living space! Take a picture and either post it on the Life With Beagle Facebook page, the @LifeWithBeagle Twitter account or email me at lifewithbeagle@gmail.com. Be sure to include the hashtag #DeckTheDogHouse! UPDATE: Just making it clear, this is not just for dogs. Owners of cats, rats, birds, turtles, fish, ferrets and other creatures are welcome. Actually decorate your pets' living space. Should you choose to do this, remember that some decorations are dangerous to pets, including garland and Christmas lights. But if you want you can decorate the area, take the picture and then remove the decorations. Digitally add the decorations, like I did in the picture above. You can use any computer program you have handy. I did that one above with Picmonkey.com, which has some cool overlays. Winners will get one of two prize packs from Hallmark, full of Charlie Brown, Snoopy and Peanuts goodness! Prize Pack One: 2 Snoopy plush, a box of Peanuts Christmas cards, a Snoopy and Charlie Brown wire figurine and a Peanuts Advent Calendar. Prize Pack Two: 1 Snoopy plush, a box of Peanuts Christmas cards and a Snoopy wore Figurine. 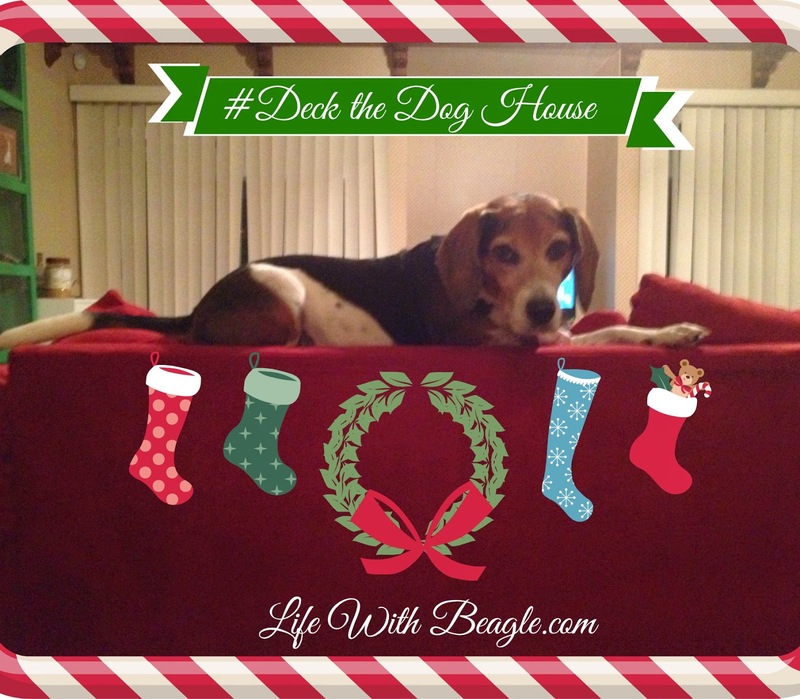 Decorate your pet's living space, either in reality or digitally, and send the picture via Facebook, Twitter or email with the hashtag #DeckTheDogHouse! FINE PRINT: Void where prohibited by law. Contest runs Dec. 1 through Dec. 20. Hallmark is providing prizes for the contest but this is not a paid contest. Sounds like loads of fun, I shared it! I don't usually decorate that much, because the rats would eat all the decorations, but now I'm trying to think of some creative and safe decorations so that I can participate! This looks like fun, we'll be decorating and sharing! Sounds like fun! You know, I just found out Snoopy is a beagle? I had no idea!